The natural gamma probe measures the total gamma radiation from natural or man.made isotopes ocuring in the formation surrounding the borehole. In the first – lithlogical – channel the probe uses a high-volume gamma scintillation detector to attain high measurement sensitivity. In the second – ranium – channel a smaller detector is used to enable measurement in higher gamma radiation environments when the first channel output is already saturated. 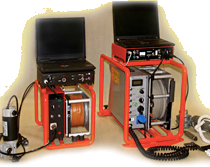 Employment of the HGG-453 in exploration of radioactive ores saves time and reduces cost.